SOLD BY :Ren Lifestyle Solutions Pvt. Ltd.
First time in India - Matcha is a superfood, combined with the detox properties of activated charcoal - you've got the perfect tea cleanse! Tea Trunk's activated charcoal is derived from coconut shells. 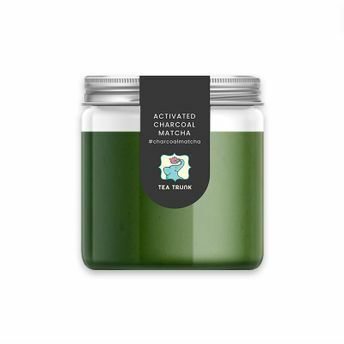 High grade quality of activated charcoal has no grit to it which means it blends beautifully with Tea Trunk's organic Japanese matcha powder. Together they make a smooth, balanced cup, rich in antioxidants and natural goodness. It has no added flavourings, colours or any additives in the blend. All natural and safe for consumption this activated charcoal matcha tops the charts for your detox regime. Kickstart your new year with a charcoal matcha tea cleanse and get ahead with those fitness goals. Serving Suggestions: Pairs well with fresh green Salad, light Sandwich or Cereal bowl. Best served hot or even iced, without milk. Best consumed in the first half of the day. Explore the entire range of Green Tea available on Nykaa. Shop more Tea Trunk products here.You can browse through the complete world of Tea Trunk Green Tea . Name of Mfg / Importer / Brand: Ren Lifestyle Solutions Pvt. Ltd.